We've teamed up with Bet Victor to bring you the latest racing news. The ground is quickening up all the time ahead of day four of Glorious Goodwood although the times suggested underfoot conditions were as described (good) going into yesterday’s racing. Eminent (1.50) has been bitterly disappointing so far this season but he is reported to be working very well at home and he certainly hinted that a step back up in trip would suit when staying on in the Summer Mile last time. Martyn Meade’s Frankel colt has only raced over 12f once previously and that was when beaten less than 2l in the 2017 Derby. The selection is 7/1 with BetVictor and I wonder if jockey Colm Donoghue will ride a similar race to the one he gave Torcedor from the front in the Goodwood Cup earlier in the week. I feel Roger Varian’s Second Step (11/4 with BetVictor) rather than market leader Mirage Dancer (2/1) is the main danger but hope to see Eminent return to his best. I am surprised to see the twice-raced Regal Reality head the market (10/3 at BetVictor) for the Gp 3 Thoroughbred Stakes and preference is for the filly Threading (2.25) who disappointed on the July course last time, but I am prepared to forgive that outing. Mark Johnston’s filly had previously finished runner up to the brilliant Alpha Centauri in the Coronation Stakes and this represents a drop in grade for a filly who broke her maiden tag at this corresponding meeting here on debut albeit over six furlongs. Threading is 7/2 with BetVictor and I will be disappointed if she doesn’t go close. South Seas (3.00) doesn’t have the best of draws in stall 13, but today’s Golden Mile looks to have been the plan for some time for connections and he gets the each way vote at 10/1 (5 places) with BetVictor. The selection may not want the ground to dry out too much, but he certainly caught the eye at Sandown last time although he would be 1lb better off if this valuable handicap were not an early-closing race. Battash (6/5 favourite with BetVictor) will be a warm order in the Gp 2 Qatar Stakes having announced himself as a real sprinting star when landing this corresponding race 12 months ago. A draw in stall one is less than ideal, however, and an each way alternative might be Kachy (3.35) who I hoped would be drawn higher in the hope that he might get to the stands’ rail. The 5-y-old cannot beat the market leader on Haydock running earlier in the season, but he is reported to be working well at home and at 7/1 with BetVictor he can reward each way support. Pretty Baby (4.40) looked ready for a seventh furlong when runner up at York last time and Dane O’Neill keeps the ride for William Haggas today. The filly (4/1 at BetVictor) has a decent draw in stall three and the main danger could be her stablemate the year older One Master who promises to be well served by the return to this 7f trip. At Galway Limini (6.50) is taken to go one better this evening having finished runner up here on Monday over two miles. The mare could easily “bounce” but she looked well ahead of her mark of 89 earlier in the week and this drop back in trip should not be an inconvenience. At Bangor the progressive Dark Invader (3.45) can land his hat-trick having scored at Worcester and Ffos Las in his last couple of starts. The selection has only been raised 8lbs for his two recent wins given the 6-y-old has won by less than a length on both occasions and the second on his penultimate start (One For Billy) has won both subsequent races. I’m looking forward to seeing Dame Nellie (5.50) back on track at Newmarket having been given a two-month break since winning at Lingfield (all-weather) last time. The filly has been slowly away on her last couple of starts and I hope she hits the gates better this evening for Nicky Mackay. 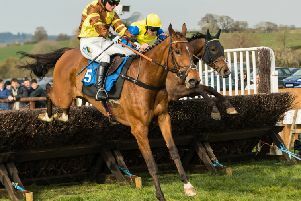 Garrus (6.25) ran a race full of promise at Windsor on debut and this colt holds entries in a couple of valuable sales’ races later in the season. James Doyle takes over this evening from Jamie Spencer on Jeremy Noseda’s colt.